History was made in Israel last night when 21 year old Yityish Aynaw became the first black winner in the history of the Miss Israel Pageant. 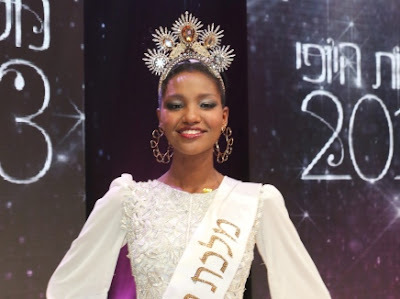 Miss Israel 2013 (or Israel's Queen of Beauty 2013) stands 1.82m tall and will represent her cuontry at the 2013 Miss World Pageant that will take place in Jakarta, Indonesia on September 28. She is of Ethiopian descent. At the same event, Bar Hefer (18), was crowned Israel's Maiden of Beauty otherwise known as Miss Universe Israel 2013. The 1.73m beauty will represent her country at the 62nd Miss Universe Pageant that will be crowned later this year. Sabina Yusupova (20) was named Israel's Queen of Grace while 18 year old Hila Balilty was named Israel's Teen Queen. The top 5 were completed by Ofir Kafih. So glad history was made in Israel. This girl is so striking and I'm sure she will stand out at Miss World. I hope she does not get wasted at Miss World because of religious issues. The Universe girls is OK but her features can appear quite harsh at times. I wish Ofir Kafih was chosen as Israel's Miss Universe delegate but this girl is not that bad. I'm looking forward to her transformation.